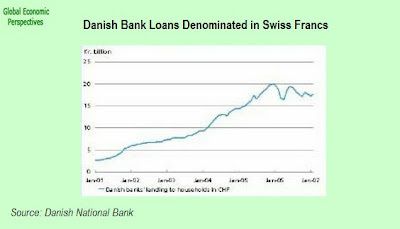 A Credit Crunch in Europe? Is Europe currently facing a widespread credit crunch, or are the problems currently being experienced in the banking sector (aka "the financial turmoil of last August") only a US phenomenon? Reading many of the articles which have been appearing in the financial press recently you could be forgiven for thinking that the latter was the case, but in fact it isn't, and the problems which are emerging in the European banking system are every bit as important as those which are to be found in the United States, a detail which was highlighted by Bank of England governor Mervyn King's statement earlier this week that the Bank is now preparing to cut interest rates several times over the next year in an attempt to reduce the knock-on effects which the banking sector problems will almost certainly have on the real economy. Or again we could take our lead from the statements which are to be found in the November Edition of the ECB Monthly Bulletin - released yesterday - to the effect that the central bank is in the process of monitoring "very closely" all current developments in the eurozone banking sector and is, in particular, ready to act on interest rates as and when necessary, drawing attention to the fact that "risks to the outlook for growth are judged to lie on the downside". Or the rather ominous "as regards the financial markets, the governing council will continue to pay great attention to developments over the period to come." Of course many observers when they read "ready to act on interest rates" naturally genuflect towards the evident current problems in short term inflation and thing about them being moved up, but cutting through the dense undergrowth of "central- bank-speak" what such phrases really are an attempt to communicate is the idea that they take everything that is happening very seriously indeed, with the mention of "downside risk" being a pointer intended to edge expectations along in the direction of accepting any eventual rate reductions which may prove necessary. 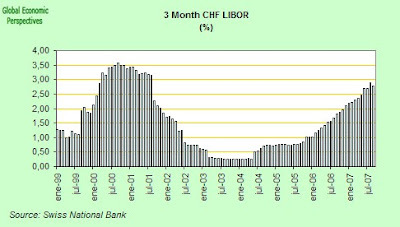 Thus it seems a little strange, to say the least, to have to note that at one and the same time as all this growing "vigilance" is being exercised, and in the precise moment when the dollar has been hard at it "slipping and a sliding" under the very weight of these selfsame problems, the euro, in contrast, has continued to rise and rise in almost vertiginous fashion, as if tomorrow would never come. And this has been taking place despite the recent warning from Jean Claude Trichet - who seems to have expressly emerged from virtual hiding for the occasion - that "brutal (foreign exchange) moves are never welcome." So what exactly is going on? Sound familiar? It should do, at least to those of you with an interest in economics it should, since this profile is very typical of one we have seen extending itself right across Central and Eastern Europe in country after country in recent months. Claus Vistesen has already extensively covered (in this post) the issue of what is called "translation risk" (or what might get "lost in translation" if the effectively "euroised" currencies like the Croatian Kuna need at some point or other to come off their near-pegs with the euro - to tackle, for example, the problem of the lack of export competitiveness which results from the combination of the rapid rise in the value of the euro and the ongoing above-par inflation which is currently being sustained in many Eastern European countries). Here I will concentrate more on some of the more general macro economic issues that the structural problems identified by the IMF pose for Croatia, and in doing so I will also attempt to situate them - as is now our custom here at GEM - in the looming demographic issues which Croatia, along with the the rest of Central and Eastern Europe and the CIS, is now about to face. Well, let's take the points one by one. 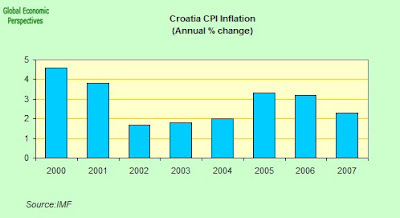 In the first place Croatia has indeed experienced steady growth and comparatively low inflation in recent years. GDP growth has been "solid" but not "exaggerated" (think the Baltics or Bulgaria), so even though the rate has at this point accelerated to an annual 6.8% in the first half of 2007 (with a high point of 7% being attained in the first quarter) the average of around 4.75% for the 2001–2006 period does not seem out of proportion, and is indeed very close to the IMF staff economists estimate of capacity growth for Croatia as being in the 4 - 4.5% region. 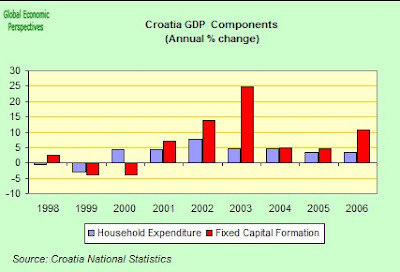 Thus it is hard at this point to speak of "overheating" in the Croatian context, although the 2007 surge in both GDP growth and construction-driven consumer indebtedness does need watching carefully. 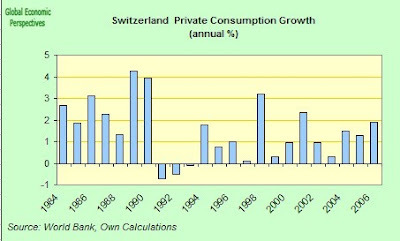 Indeed contributions to growth from both private consumption and fixed capital formation have increased in the last few years, and both of these have been associated with rapidly expanding domestic credit and a continuing goods trade deficit which is the by-product of a growing dependence on imports. The contribution of net exports to growth has been substantially negative, with domestic demand pressures and higher international energy prices leading both the trade deficit and the current acount one to widen as the century has advanced. Now this sustained drop in export competitiveness should be sending out alarm signals all over the place for those with the eyes to see what is happening. Basically to understand what may happen to countries like Croatia it is important to bear in mind that we do not live in the timeless world of neo-classical growth theory, but in the world of real economies in real time where populations come and go, and, in particular, age. 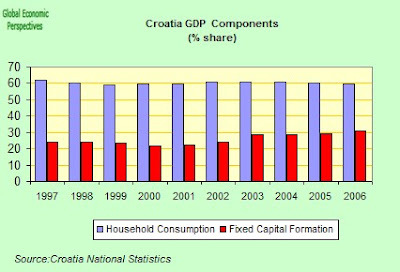 I will return to this point later in the post, but the big danger I see in Croatia is that as the demographics shift inexorably upwards to ever higher median ages, and as the share of fixed capital investment (which has been basically accelerated by large government funded civil engineering projects and domestic housebuilding) drops back (due to the fiscal constraints impost by a higher elderly dependent population on the one hand and the liquidity constraints on a steadily older population in terms of housebuilding activity on the other) then domestic demand will undoubtedly weaken as we have seen in other high median age societies, and Croatia will come to need to depend more and more on exports to eke out growth. 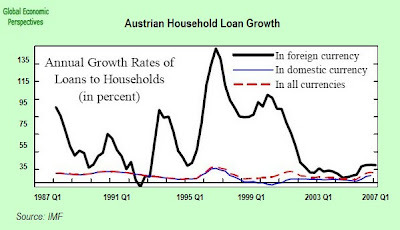 This is the process we have seen in Germany since the end of the property boom in the mid 1990s, and while, as I explain in this post, Germany has been able to shift the weight of maintaining employment growth on to the export driven back foot, it is hard to see how Croatia is going to be able to do this given the relative price structures that are emerging. And time here, along with population, is becoming an increasingly scarce commodity. 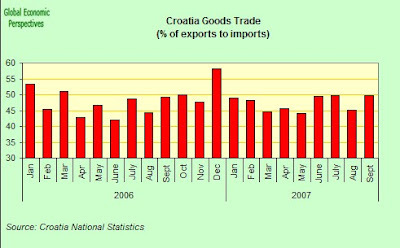 During 2007 the share of goods exports to imports (remember, due to the tourism element Croatia has a positive balance on services, but not sufficient to "sweat off" the goods trade deficit) has been hovering round the 45% to 50% mark. 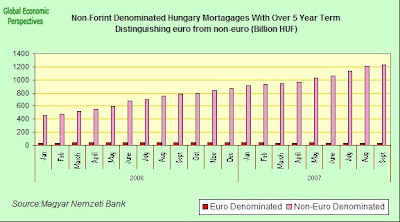 Meanwhile, while headline inflation has been normally contained within the 2–4% range in recent years (see chart above) - and with core inflation even lower - in recent months the inflation rate has started to tick upwards following a pattern which has recently become all too familiar across Eastern Europe. 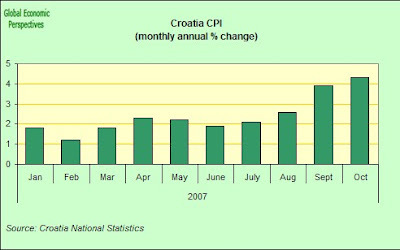 Obviously it is too early at this point to say where this is leading, but the situation does need careful monitoring, and the Croatian central bank remember cannot use monetary policy here (see more on policy instruments below) due to euroisation, and is left depending on the national government implementing a strong fiscal surplus to drain excess demand from the system. 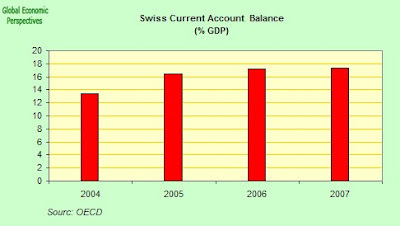 Now one of the problems which comes into operation in a situation like Croatia's where there is an effective euro peg, is that exchange rate and monetary policy become either effectively non-existent (in the former case) or impotent (in the latter) to correct any growing competitiveness problems - since given the euroisation it is not practical to adjust downwards the exchange rate and increasing the interest rate only puts upward pressure on the currency and attracts additional funds in search of yield which only serve to make the excess demand problem even worse. Thus the only real arm left in the government policy arsenal is the fiscal policy one, whereby the government attempts, by running a fiscal surplus, to "drain domestic demand" from the system, and thus work to effect some form of price deflation (for a fuller discussion of this complex topic in the Latvian context see this post). And this, of course, is exactly the policy that the IMF economists tirelessly advocate that the Croatian government practices. Obviously the fact that this has been an election year hasn't exactly helped put politicians in the frame of mind to pay the necessary heed to the IMF recommendations and spending pressures have been steadily mounting. Government approved increases in child and maternity benefits and free school textbooks (all of which are in principle a good thing in a society which is short of children) were introduced at the end of last year, adding in the process 0.3% of GDP to expenditure, without compensatory reductions in spending elsewhere (unfortunately here there are no free lunches). Demands to boost wages in the state sector have been frequent in the run up to the election, as have those to increase the pensions of post-1999 retirees — whether this be through a reversal of the existing pension reform parameters, or through "off-budget" accounting schemes. 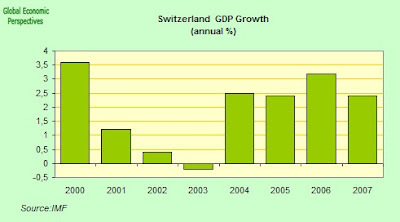 Now evidently increased economic growth can bring in increased revenue which can help pay for extra spending, but if the economy is already running up against its capacity limits then that growth can only have one result, increased inflation, and given the effective euro-peg this inflation means only one thing, a loss of export competitiveness. What has been happening elsewhere in Eastern Europe should give clear indication that this is no joking matter. The IMF estimate that if such spending pressures are acceded to by the incoming government then the consequent fiscal deficit could rise above 2.8 percent of GDP unless the envisaged increases are offset by cuts elsewhere. The Croatian authorities have, for example, already agreed with the public sector trade unions to a 6 percent wage increase (in place of the 5% increase initially assumed in the budget) and to paying bonuses to teachers in addition to the basic wage increase, again straining the budget wage bill. Moreover, it is anticipated that the national airline will receive additional unbudgeted subsidies. On the surface it would appear that spare capacity does exist, since the unemployment rate remains high, despite recent declines that reflect both some small employment growth and a declining rate of labor-market participation. But this nominally high unemployment level may be deceptive since we do not know the quality of much of this (often elderly) reserve labour army, and indeed we do not even know how many of the people involved are even in the country (see below). It also would seem that fixed capital investment growth — after the rapid acceleration we have seen in recent years — is likely to moderate, though investment remains high as a share of GDP. 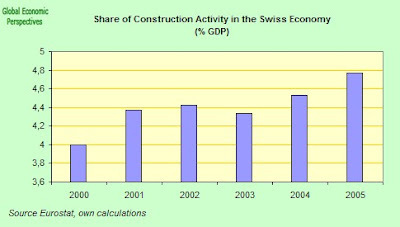 If we look at construction activity, we can see that after taking off in early 2005, and remaining strong throughout 2006, the rate has remained more or less stable in 2007, and we have not seen further dramatic increases in activity. Thus while pressure on manpower and salaries in the construction sector remains, it does not seem to be accelerating dramatically at this point. 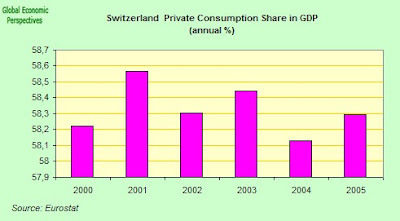 However we should note that within a constant level of activity, the relative shares have changed, and domestic homebuilding - fuelled by comparatively cheap euro or swiss franc loans, and financed by streams of income from remittances - has now become a much bigger partner, while government financed large-scale civil engineering projects have become steadily less important (see the charts on domestic mortgages below). 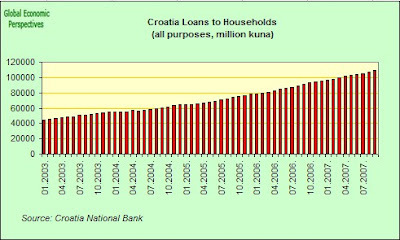 And it is not just the IMF who has been raising the alarm signal, the Croatian National Bank has also repeatedly expressed its concern over the high rates of credit growth, and indeed has already responded with a series of prudential measures in the course of the last year. The measures include actions to raise private bank Minimum Reserve Requirements and to close loopholes in the system which allowed banks to borrow abroad via local nonbank intermediaries. 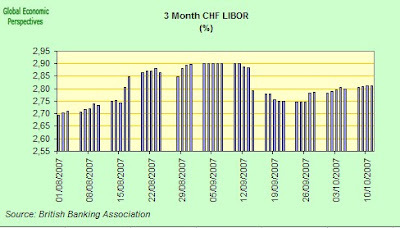 The bank has also increased risk weights on unhedged foreign-currency denominated and indexed loans, introduced quarterly reporting requirements for such loans and issued new guidelines to banks on managing household and currency-induced credit risk, including a 75 percent loan-to-value ratio limit. Such measures mirror to a certain extent those which we have already seen put into effect by Central Banks in the Baltic countries. 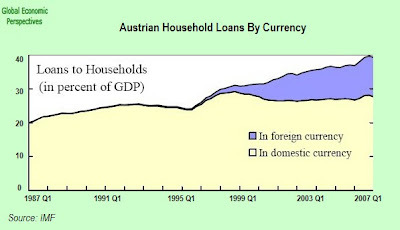 As can be seen in the chart the level of consumer indebtedness has risen sharply since the start of 2003. 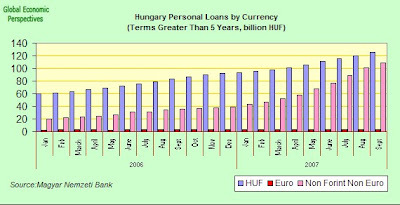 Now the above chart shows the movement in credit for kuna denominated loans (and I present a chart below for loans which are explicitly denominated in foreign currency) but it is important to keep firmly in mind at this point that the Croatian economy is highly "euroised" and that 75 percent of long-term bank loans to households are index linked to foreign currencies in some way or another (mainly to the euro, though recently loans have been largely Swiss-franc, a feature which was explicitly noted by the Bank for International settlements in a recent study of the extent of Swiss Franc lending in Eastern Europe earlier this year, where Hungary and Croatia where singled out as having a significant penetration of such loans, due presumeably to the strong presence of Austrian banks in both countries). Of all the transition countries that have joined or are soon to join the EU, Croatia has the highest share of euroised bank deposits, with approximately three quarters of all deposits being in euros. 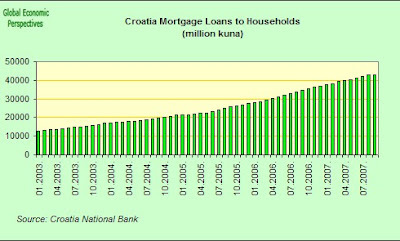 Virtually all loans in Croatia are indexed, and all loans depend on the exchange rate and are thus exposed to exchange rate risk. One way to remove this exchange rate risk would, of course, be to introduce the euro, but when you come to look at the economic stress issues which are emerging in one Eastern European economy after another, then it would seem that this potential solution lies a long way out in the future, at the very earliest. Meantime Croatia has to survive, and to export to live. Prices and wages as expressed in kuna need to become more competitive, and this is begining to represent a major problem. 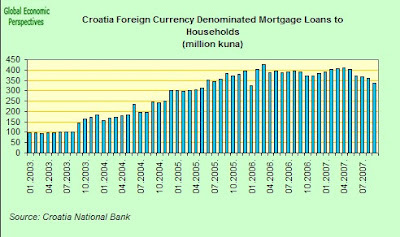 So when you look at the next chart please bear in mind that this only gives an indication (and represents only a small fraction) of the true exposure which the Croatian economy has to any possible future exchange rate adjustment. 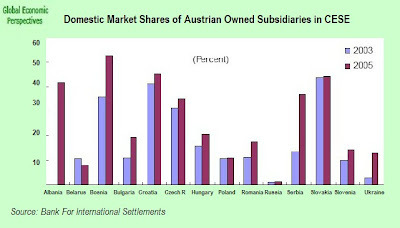 Total foreign direct investment (FDI) into Croatia is close to the regional average—but with a high share of this being associated either with privatizations or the financial sector, while “greenfield” FDI remains well below what could be thought to be desireable. 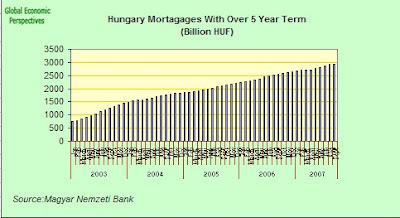 This is disturbing, since FDI which exclusively takes the form of privatisation participation is effectively a form of outsourcing state debt, and at some stage all of this has to be repaid in the form of income outflows and thus negative consequences for the current account, as Hungary is currently finding out to her cost. Net FDI inflows averaged just below 5% of GDP annually during 2001–05, and 1.5% of GDP of this was accounted for by privatizations. 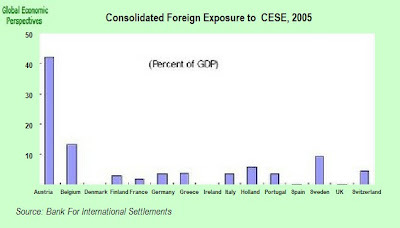 The financial sector has received a very large share of FDI (both privatization and new capital), whether we are talking about the longer term (28 percent of total inflows over 1993–2005) or more recently (over 50 percent of FDI in 2005, partly reflecting capital injections to foreign-owned banks). 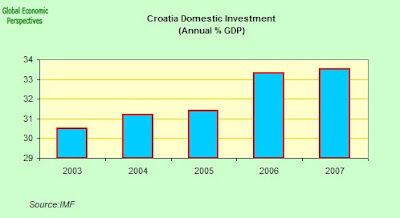 Meanwhile non-privatization, non-financial sector related FDI inflows into Croatia have remained modest. The rise in external debt has been accompanied by a major change in its distribution between domestic sectors. 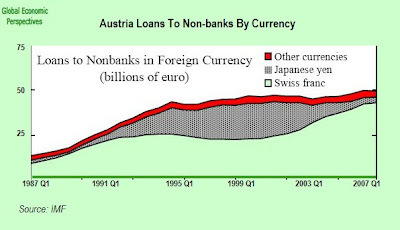 Prior to 2001 foreign borrowing was driven primarily by the public sector. Financing requirements were high due to massive reconstruction needs and infrastructure investment following the regional conflicts of the early 1990s. As a result, the public sector held the largest share of total external debt (44%), equivalent to around 27% of GDP in 2001. Since early 2002 the situation has changed dramatically. The public sector external debt-to-GDP ratio as well as its share in total debt has declined, partly as a result of a deliberate move towards tapping the domestic capital market. At the same time, the external debt of the private sector has started to grow strongly. 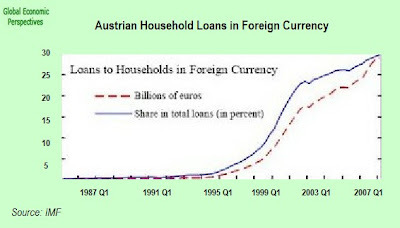 This trend has been driven, in particular, by a strong increase in foreign borrowing by domestic banks, facilitated by foreign ownership and easy access to financing from parent banks in neighbouring EU countries. As a result, the gross external debt of the banking sector increased from 11% of GDP in 2001 to above 30% in 2006, and its share of total external debt almost doubled. Since 2003 direct external borrowing by firms has expanded rapidly, inter alia in response to administrative measures taken by the central bank to reduce the growth of domestic credit. As the header to this post suggests, we are thinking here about Croatia's economic situation in the context of general processes which we can observe in operation across the whole of central and Eastern Europe. 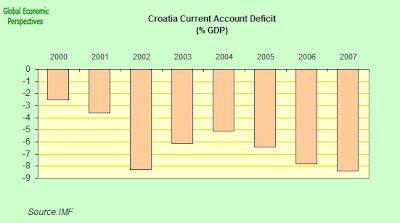 The most important of Croatia's problems is undoubtedly constituted by its deteriorating external competitiveness, as reflected both the goods and services trade deficit (see above) and, in particular, in the current account deficit. 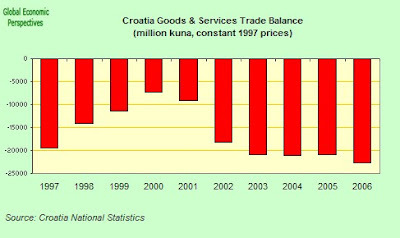 One typical feature of Croatia's current account is - as I have said - the significant deficit in merchandise trade, which is offset to some considerable extent by a surplus in services, mainly resulting from tourism. 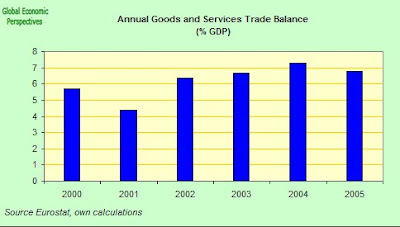 However it is important to note that from 2001 to 2006 imports grew, on average, faster than exports and that the goods trade deficit rose from 20.7% to above 25% of GDP. During the same period net income from services increased from 14.7% to around 17% of GDP and "financed" about two thirds of the trade gap. The income balance remained negative over this period, with an average deficit of 3% of GDP largely driven by net factor payments on the rising foreign debt and foreign direct investment. However, reinvested earnings recorded as offsetting FDI inflows on the financial account were equivalent to, on average, around half of the deficit of the income balance, thus reducing financing requirements considerably. Also it is worth noting that net transfers from abroad in the form of remittances have been a growing and fairly stable source of financing. Remittances were estimated by the World Bank to have been worth around 3% of GDP in 2006. 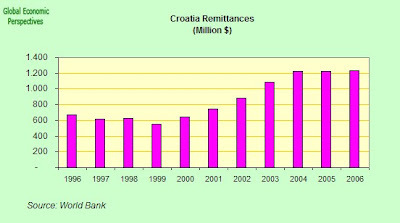 Now one of the interesting things about this data on remittances is that it can help us take a first shot at solving another of Croatia's enigmas, the "missing labour force" one, or if you prefer, why the employment participation rate of the Croatian population seems to be so incredibly low (only 42.8% of the over 15 population in the first quarter of 2007). Now one of the factors here must surely be the very low participation rates of males workers in the 50 to 64 age group (only 55.9% in Q1 2007) , but another feature of this apparently very low participation rate must surely be associated with the fact that significant numbers of Croatians must be working abroad without recognition of this being reflected in the published figures. (This is quite a widespread problem with the East European data, as I explain in this post here). We can get some impression of the extent of the issue if we compare the 3% of GDP number for Croatian remittances with the 4.1% for Romania and the 1.3% for Poland (World Bank data) since in both cases substantial numbers of nationals are known to be working abroad. 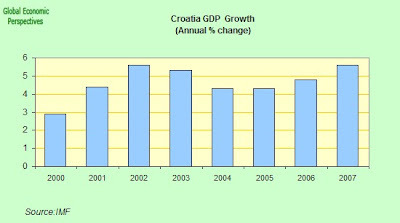 The size of the Croatian share makes it reasonable to assume that a reasonably large number of Croatians are economic migrants working abroad, but if we come to look at the statistics provide by the Croatian Statistics Office to Eurostat, you would never imagine this was the case, since you would get the impression that Croatia was a small net receiver of migrants. Now the very large movements of population in the 1990s are undoubtedly associated with the war and political convulsions of the time, but since the turn of the century virtually no movement is observed (apart from the flow of money), and how is this possible I ask myself? Undoubtedly one of the answers is likely to be found in the definition of 'migrant' which is used by the local authorities, who surely, as is standard practice across Eastern Europe, only classify as migrants those who emigrate permanently. The rest simply don't show up in the data, and surely the majority of Croatia's economic migrants who currently work abroad still entertain the hope of returning "one day". 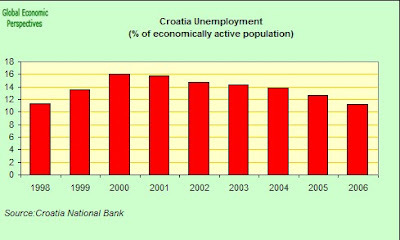 But this is not the same as being "ready and available for work tomorrow", and the labour market data we have to go on simply don't reflect this underlying reality, and this is important, if Croatia doesn't one day want to find itself with an inflation bonfire getting steadily out of hand such as the one which is currently to be found in the Baltics. As a break from my previous practice I am including the demographic data on Croatia as an appendix, in a way which means that it "informs" the economic analysis (in the sense that it is ever present, and should be ever present in our minds) without occupying the centre stage. The demographic backdrop forms the context within which day-to-day policy needs to operate. 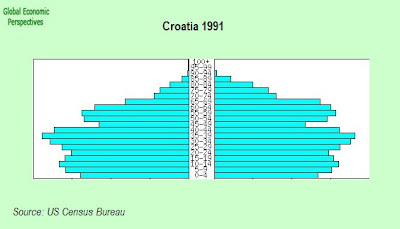 Here, then, is a collection of population data, which illustrate how the structure of the Croatian population is in the process of undergoing profound change in the years between 1990 and 2020, indeed, one could say that this is the critical socio-economic window in the history of this nation. 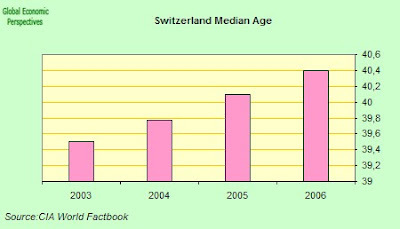 Firstly we have the median age. Claus and I tend to use median age data for a convenient proxy for a variety of economic phenomenon, such as saving and consumption patterns, construction activity, gross fixed capital formation, export dependence, productivity of the workforce as a collective etc. This is still all rather controversial, but one of the purposes of this blog is to test out these connections in real time as the global economy unfolds. As we can see the median age is steadily rising, and is currently in the process of crossing what Claus and I consider to be the critical 40 threshold. 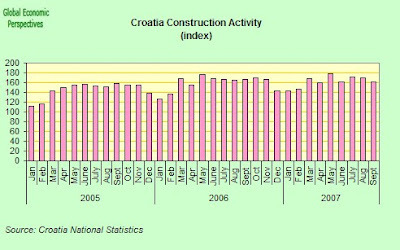 This means that, ceteris paribus, the structural characteristics of the Croatian economy will almost certainly change in the coming years, with a decline in construction and an ever more pronounced export dependence, something which is going to be difficult to realise given the relative currency and output prices. There are basically three drivers of median age and population ageing - fertility, life expectancy and migration. 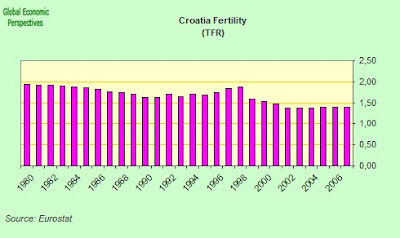 Here we can see that Croatian fertility has been below replacement level since the late 1970s. 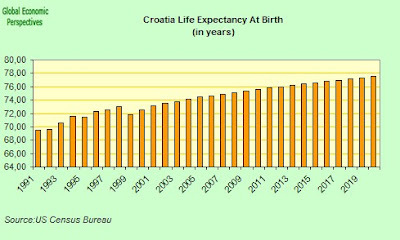 At the same time Croatian life expectancy has been increasing steadily. 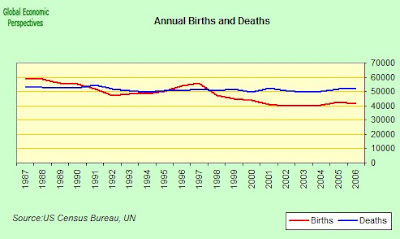 The combined combination of these two processes is that after hoevering around the break even point in the early 1990s, the balance of Croatian births and deaths decisively turned negative around 1998. 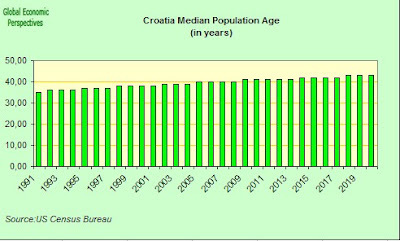 The result of this is of course that the natural rate of growth of the Croatian population has dropped and dropped, and is now well into negative territory. 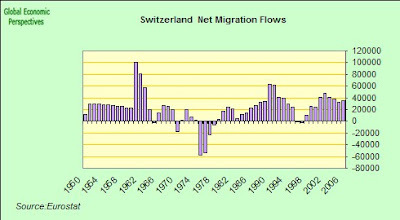 As far as migration goes, we have seen above that we have no clear data for this, although there is evidence from the remittances data that a significant number of Croatians now live and work abroad, which means that to the negative natural drift in the population we need to add an as yet unknown number of emigrants, as such the population and labour supply data that we are currently working with is almost certainly highly deficient. 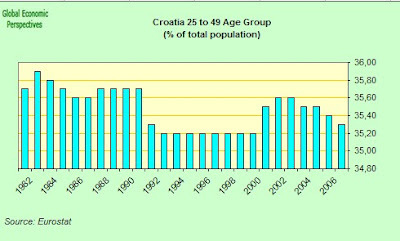 All of this means that there have been deep and significant changes in the age structure of the Croatian population, and this does seem to have considerable ecnomic significance. 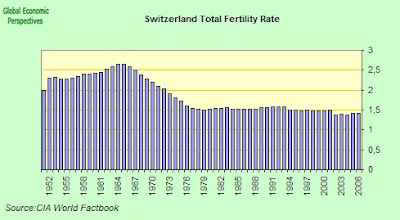 As one example of this I will present the chart for the key 25 to 49 age group. 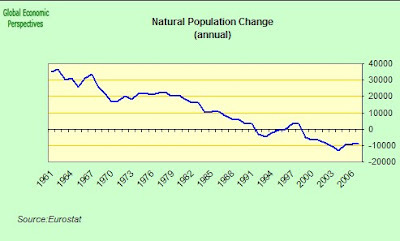 Obviously we get some very strange readings for the years in the mid 1990s, but this is perhaps hardly surprising given what was going on, the interesting point is that this groupd definitively peaked as a population share around 2002, and has now entered decline. Among other things this will mean that obtaining collective productivity growth will now become more difficult year by year, as improvements due to sectoral shifts will be to some extent (and increasingly) offset by declining aggregate input quality in human capital terms. 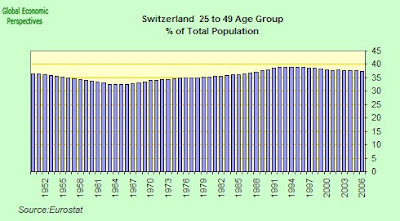 It is also interesting to note that this age group peaked at what is the comparatively low value of 35.9 back in 1982, which is incredibly early and as I say, very low (a phenomenon which we are seeing in one East European society after another due to their particularly unusual demographic history). I am not quite sure yet what significance to put on this feature, but surely it does have some. I guess we are now about to see what. Finally, I present three population pyramids for Croatia, which give some quick impression of the evolving structural shifts in the age groups. 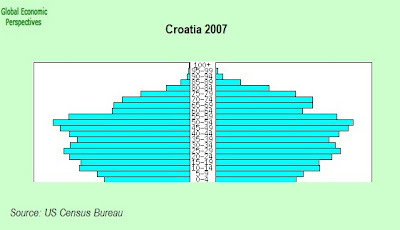 The first pyramid, which comes from 1991, has a structure which is not at all unfavourable to rapid economic growth of the kind Croatia is now having. 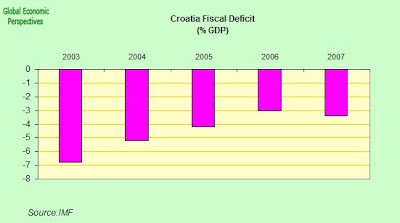 Croatia's misfortune is that it is trying to have this growth now, and not back then. 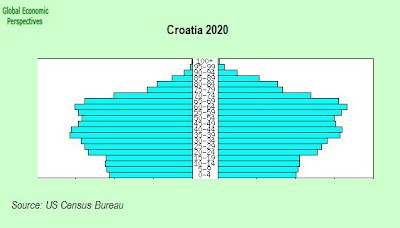 The final pyramid which is an estimate based on the UN median estimate of population development gives some idea, possibly a rather optimistic one, of what Croatia's population will look like come 2020. 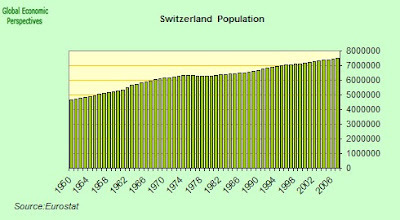 Basically it is very hard to see how a population with such a structure is going to achieve economic growth at all.